Welcome to the MACH3Ti.com web Site. Please be assured that I have the experience and training with advanced aerospace materials, metal alloys, and composites to authenticate the items represented on this web site. I have 30+ years in my profession. As a Supervisor and Chief of Metals Technology for the 9th Reconnaissance Wing I managed personnel and assets in the maintenance of SR-71 Blackbird, U-2 Dragonlady, KC-135Q Stratotanker, and T-38 Talon aircraft. My career experience also involved supervisory machinist support on the following airframes and related support equipment, B-52G, B-52H, KC-135A, T-37, A-10, UH-1. 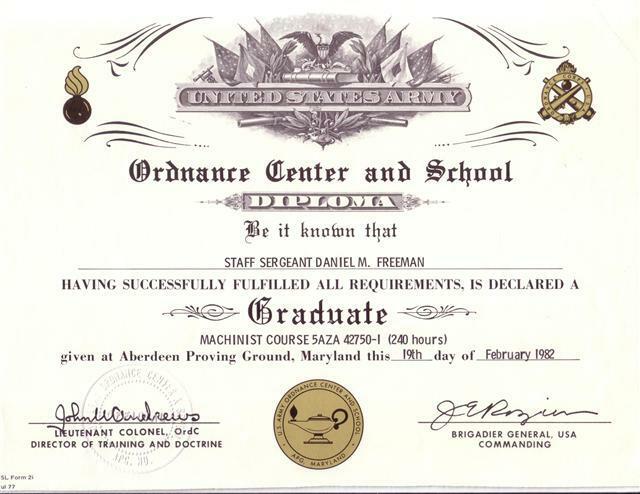 I was twice PRP certified to work on nuclear weapons systems and routinely performed maintenance on live nuclear weapons and "cocked" nuclear weapons system assets and alert aircraft. I also had the extreme honor working for the Lockheed Martin Corporation as a Machinist / Welder maintaining Blackhawk and Chinook helicopters in support of the US Army, 160th AVIM, Panama. During the SR-71/ U-2 program our teams work Involved fabrication, modification, and emergency repairs, providing mission and launch support of aircraft and support equipment. As a team leader I supervised all metal working operations using the latest advanced equipment and machine tools, metals processing and joining techniques as well as heat treating, electroplating, and testing. Responsibilities included work center management, training apprentices, designing and fabricating special tools, and fixtures, upgrading and improving procedures and technical publications for system components on the SR-71 Blackbird, the Worlds most advanced all titanium aircraft. Our team reworked and improved the techniques for rebuilding the SR-71 propulsion system Inlets, Forward By-Pass Doors, the most critical system responsible for the high speed performance and safe operation of the SR-71 aircraft. The function of these inlet systems are unfathomable being capable of controlling 100,000 cubic feet of air per second. The SR-71 Blackbirds set numerous World speed records flying at sustained speeds over 2200 miles per hour at over 85,000 feet in altitude. These records to this day have not been broken. This is the original MACH3Ti web site that has been promoting the remarkable history of our SR-71 Blackbirds since 2007. MACH3Ti rings are custom designed by YOU the customer, allowing for desired styles, thicknesses, widths, finish, and color. MACH3Ti uses only 100% mission flown titanium. The SR-71 Blackbirds flew multiple secret missions of the highest national priority during the Cold War. The titanium parts are confirmed and have been inspected by the top experts who worked in the SR-71 program. There are No seams or pressed in fillers or any other materials such as inlays or cheap plating's. They are NOT machined, they are totally hand made. They are NOT melted, cast, or trepanned. They are formed by hand which preserves the original attributes, while displaying the original Lockheed Skunk Work’s remarkable construction processes. All customers are very welcome to visit my facility to inspect the actual parts that your item will be composed from. You can see the parts with the parts numbers, identifying inspection stamps, the original coatings, etc. You may request photos showing the step by step process in the making of your item. You will receive high quality, personalized certificates, fact sheets, as well as other documentation identifying the history and authentication of your item. I also have the ability to enlarge your MACH3Ti ring. I use no automated or standard machine tools in the creation of my rings and collectibles. Each ring is meticulously crafted by hand using only basic hand tools. Each ring employs a three day process to complete. The authentic materials are actual used mission flown parts that were subjected to the most punishing environments that any aircraft in history has been exposed to. Because of this, the materials may contain original Skunk Works, tooling marks, wear chaffing, fabrication and surface stress indications. When possible these visual imperfections are left intentionally. They are a part of the phenomenal history of mankind's greatest achievement in aviation. Colorized Titanium Rings are a natural effect of the SR-71 Titanium. The titanium is highly resistance to acids, alkalines, and salts. However when the titanium is submitted to high temperatures it has a high affinity to oxygen. This means that the metal absorbs oxygen creating oxides where exposed on it surface. This is a beneficial characteristic of the titanium allowing the metal to virtually "heal" itself, protecting it from further corrosive actions. These oxides form a very thin transparent layer on the surface which disperses the refracted light in all the colors of the rainbow. For my Titanium Rings, I use the natural flame method. My process allows for a full deep gloss finish. The colors displayed are the natural colors produced by the composition of the alloy and the variation of oxygen absorbed into the titanium's surface resulting in a more reflective and colorful surface. FYI- It was by accident that the test engineers discovered the natural radar emissivity of the Blackbirds Titanium. The special characteristics and properties exhibited by this Titanium played a key role in its success. One being that the Titanium provides fifty more times direct current resistance than aluminum and even more so while at operating temperature. The result is the Blackbirds having a naturally lower radar cross section. This photo shows me holding in my bare hand a small shard of Titanium from the SR-71, glowing RED HOT! Try that with a piece of aluminum or stainless steel. The materials I use are ACTUAL SR-71 BLACKBIRD PARTS. These parts were installed and used on the Blackbird airframes during many top secret high speed missions flying at altitudes near the edge of space. They were replaced during the course of normal maintenance and sold as scrap metal 25 years ago. From a mission flown part of the SR-71's Ejector Nozzle to a beautiful and unique set of Titanium rings. Your rings will be composed from the special Grade 6 Titanium Alloy with history beyond reproach. These Low Profile style rings still retain and display the original "Skunk Works" fabrication spot weld impressions. A specially developed material and process that provided the strength and durability to propel the Blackbirds at over 2200 mph at the edge of space. BEWARE of fakes and imitations claimed to be made from stolen items from federal government property crash sites. These are sacred places where our heroic aircrews were lost and injured. Take heed and caution to items now being sold by unscrupulous dealers on rip-off auction sites. Those crash site materials are contaminated with the toxic debris used in system components as well as asbestos. It’s illegal to dig up these sites on federal lands. Disturbing these sites can cause exposure and contamination to surrounding areas to include radioactive, carcinogenic, and extremely dangerous compounds. It’s also illegal to possess, sell, or purchase stolen government property. Those other materials are shamefully pilfered from the sacred sites that remain as memorials to those who sacrificed for duty, honor, and country. A few of the aircraft I worked on during my career.